John Dickson is a former diplomat and author of the blog historyallaround.org. 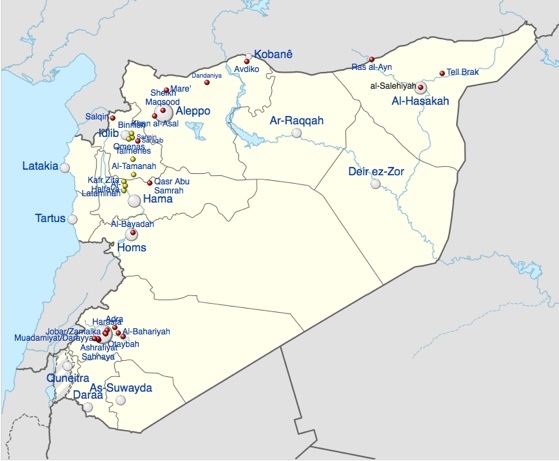 The map marks the position of reported chemical weapons attacks in the Syrian Civil War. Yellow markers indicate chlorine attacks. Red indicate a more deadly chemical weapon agent. The great undoing has started. President Obama’s most defining achievements – from healthcare reform and economic recovery to the drawdown of wars in Iraq and Afghanistan – divided the country to the extent that our new President and Congress are hell bent on undoing anything that might be considered an enduring legacy. On August 29, the British Parliament voted against Prime Minister David Cameron’s motion condemning Assad for the attack, the first step for British participation in military intervention. Weighing heavily on that vote was the still fresh memory of the consequences of British involvement in the Iraq war. The red line narrative that ought to be taking hold as the nation prepares for the transfer of power reveals a leader who laid out a concrete goal and achieved it, through diplomacy that involved the UN, friends and allies, and even adversaries. We will come to appreciate such strategic deliberation. My thread of hope is that we as a nation do not pay too high a price for the untethered, transactional bullying that lies ahead.